This article is about the crimson-dye-producing insect of the Dactylopiidae family. It is not to be confused with the crimson-dye-producing insects of the Margarodidae family sometimes called Armenian cochineal and Polish cochineal. 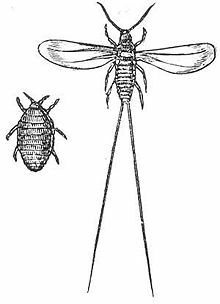 The cochineal (/ˌkɒtʃɪˈniːl/ KOTCH-ih-NEEL, /ˈkɒtʃɪniːl/ KOTCH-ih-neel; Dactylopius coccus) is a scale insect in the suborder Sternorrhyncha, from which the natural dye carmine is derived. A primarily sessile parasite native to tropical and subtropical South America through North America (Mexico and the Southwest United States), this insect lives on cacti in the genus Opuntia, feeding on plant moisture and nutrients. The insects are found on the pads of prickly pear cacti, collected by brushing them off the plants, and dried. 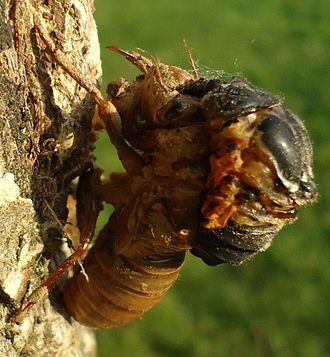 The insect produces carminic acid that deters predation by other insects. Carminic acid, typically 17-24% of dried insects' weight, can be extracted from the body and eggs, then mixed with aluminium or calcium salts to make carmine dye, also known as cochineal. Today, carmine is primarily used as a colorant in food and in lipstick (E120 or Natural Red 4). The carmine dye was used in North America in the 15th century for coloring fabrics and became an important export good during the colonial period. After synthetic pigments and dyes such as alizarin were invented in the late 19th century, natural-dye production gradually diminished. Health fears over artificial food additives, however, have renewed the popularity of cochineal dyes, and the increased demand has made cultivation of the insect profitable again, with Peru being the largest exporter. Some towns in the Mexican state of Oaxaca are still working in handmade textiles using this cochineal. Chemical structure of carminic acid, the predator-deterring substance found in high concentration in cochineal insects: The insoluble aluminium and calcium salts of this acid form red and purple dyes called "carmine". Cochineal is derived from the French "cochenille", derived from Spanish "cochinilla", in turn derived from Latin "coccinus" meaning "scarlet-colored", or from the Latin "coccum", meaning "berry yielding scarlet dye". See also the related word kermes which is the source of a similar but weaker Mediterranean dye also called crimson, which was used to color cloth red before discovery of cochineal in the New World. 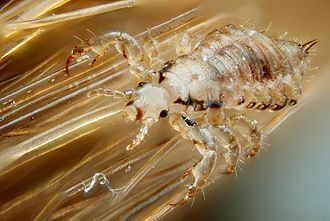 Some sources identify the Spanish source word for cochineal as cochinilla "wood louse" (a diminutive form of Spanish cochino, cognate with French cochon, meaning "pig")." Cochineal dye was used by the Aztec and Maya peoples of North and Central America. Eleven cities conquered by Montezuma in the 15th century paid a yearly tribute of 2000 decorated cotton blankets and 40 bags of cochineal dye each. 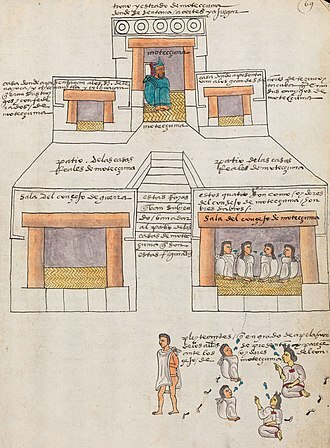 Production of cochineal is depicted in Codex Osuna. During the colonial period, the production of cochineal (grana fina) grew rapidly. Produced almost exclusively in Oaxaca by indigenous producers, cochineal became Mexico's second-most valued export after silver. 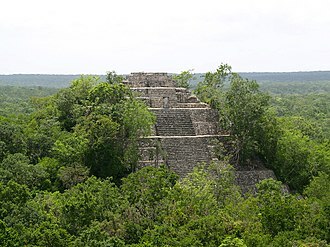 Soon after the Spanish conquest of the Aztec Empire, it began to be exported to Spain, and by the 17th century was a commodity traded as far away as India. The dyestuff was consumed throughout Europe and was so highly prized, its price was regularly quoted on the London and Amsterdam Commodity Exchanges (with the latter one beginning to record it in 1589). 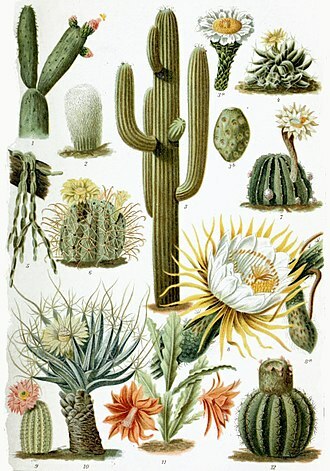 In 1777, French botanist Nicolas-Joseph Thiéry de Menonville, presenting himself as a botanizing physician, smuggled the insects and pads of the Opuntia cactus to Saint Domingue. This particular collection failed to thrive and ultimately died out, leaving the Mexican monopoly intact. After the Mexican War of Independence in 1810–1821, the Mexican monopoly on cochineal came to an end. Large-scale production of cochineal emerged, especially in Guatemala and the Canary Islands; it was also cultivated in Spain and North Africa. The demand for cochineal fell sharply with the appearance on the market of alizarin crimson and many other artificial dyes discovered in Europe in the middle of the 19th century, causing a significant financial shock in Spain as a major industry almost ceased to exist. The delicate manual labour required for the breeding of the insect could not compete with the modern methods of the new industry, and even less so with the lowering of production costs. 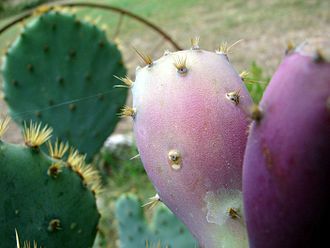 The "tuna blood" dye (from the Mexican name for the Opuntia fruit) stopped being used and trade in cochineal almost totally disappeared in the course of the 20th century. In recent decades, the breeding of cochineal has been done mainly for the purposes of maintaining the tradition rather than to satisfy any sort of demand. However, the product has become commercially valuable again. One reason for its popularity is that many commercial synthetic red dyes and food colorings have been found to be carcinogenic. The carmine of antiquity also contains carminic acid, and was extracted from a similar insect, Kermes vermilio, which lives on Quercus coccifera oaks native to the Near East and the European side of the Mediterranean Basin. Kermes carmine was used as a dye and a laked pigment in ancient Egypt, Greece, and the Near East and is one of the oldest organic pigments. Recipes for artists' use of carmine appear in many early painting and alchemical handbooks throughout the Middle Ages; the laking process for both pigments was improved in the 19th century. Carmine was not light-fast and was largely abandoned in art. Spanish influence changed the way in which Aztecs used pigments, particularly in their manuscripts. For example, Cochineal was replaced by Spanish dyes like minium and alizarin crimson. 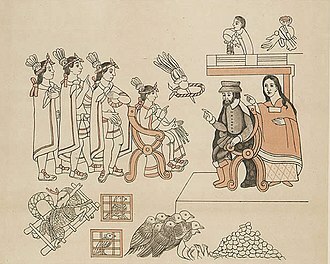 The image of Moctezuma's death (seen to the right) uses both indigenous and Spanish pigments, and is therefore representative of the transition and influence between cultures. Cochineal insects are soft-bodied, flat, oval-shaped scale insects. The females, wingless and about 5 mm (0.20 in) long, cluster on cactus pads. They penetrate the cactus with their beak-like mouthparts and feed on its juices, remaining immobile unless alarmed. After mating, the fertilised female increases in size and gives birth to tiny nymphs. The nymphs secrete a waxy white substance over their bodies for protection from water loss and excessive sun. This substance makes the cochineal insect appear white or grey from the outside, though the body of the insect and its nymphs produces the red pigment, which makes the insides of the insect look dark purple. Adult males can be distinguished from females in that males have wings, and are much smaller. The cochineal disperses in the first nymph stage, called the "crawler" stage. The juveniles move to a feeding spot and produce long wax filaments. Later, they move to the edge of the cactus pad, where the wind catches the wax filaments and carries the insects to a new host. These individuals establish feeding sites on the new host and produce a new generation of cochineals. Male nymphs feed on the cactus until they reach sexual maturity. At this time, they can no longer feed at all and live only long enough to fertilise the eggs. They are, therefore, seldom observed. In addition, females typically outnumber males due to environmental factors. Dactylopius coccus is native to tropical and subtropical South America and North America in Mexico, where their host cacti grow natively. They have been widely introduced to many regions where their host cacti also grow. About 200 species of Opuntia cacti are known, and while it is possible to cultivate cochineal on almost all of them, the most common is Opuntia ficus-indica. 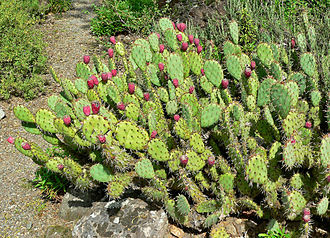 D. coccus has only been noted on Opuntia species, including O. amyclaea, O. atropes, O. cantabrigiensis, O. brasilienis, O. ficus-indica, O. fuliginosa, O. jaliscana, O. leucotricha, O. lindheimeri, O. microdasys, O. megacantha, O. pilifera, O. robusta, O. sarca, O. schikendantzii, O. stricta, O. streptacantha, and O. tomentosa. Feeding cochineals can damage and kill the plant. 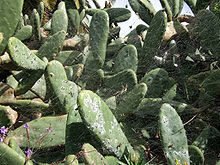 Other cochineal species feed on many of the same Opuntia, and the wide range of hosts reported for D. coccus likely is because of the difficulty in distinguishing it from other Dactylopius species. 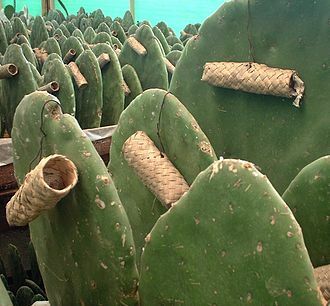 A nopal cactus farm for the production of cochineal is traditionally known as a nopalry. The two methods of farming cochineal are traditional and controlled. Cochineals are farmed in the traditional method by planting infected cactus pads or infesting existing cacti with cochineals and harvesting the insects by hand. The controlled method uses small baskets called Zapotec nests placed on host cacti. The baskets contain clean, fertile females that leave the nests and settle on the cactus to await fertilization by the males. 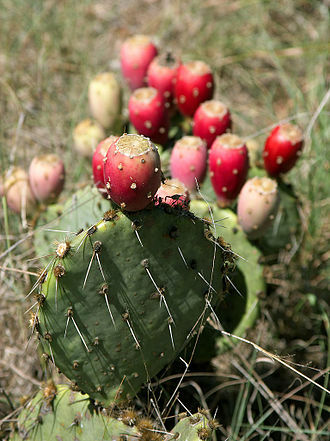 In both cases, the cochineals must be protected from predation, cold, and rain. The complete cycle lasts three months, during which time the cacti are kept at a constant temperature of 27 °C (81 °F). At the end of the cycle, the new cochineals are left to reproduce or are collected and dried for dye production. To produce dye from cochineals, the insects are collected when they are around 90 days old. Harvesting the insects is labour-intensive, as they must be individually knocked, brushed, or picked from the cacti and placed into bags. The insects are gathered by small groups of collectors who sell them to local processors or exporters. Several natural enemies can reduce the population of the insects on hosts. Of all the predators, insects seem to be the most important group. Insects and their larvae such as pyralid moths (order Lepidoptera), which destroy the cactus, and predators such as lady bugs (Coleoptera), various Diptera (such as Syrphidae and Chamaemyiidae), lacewings (Neuroptera), and ants (Hymenoptera) have been identified, as well as numerous parasitic wasps. 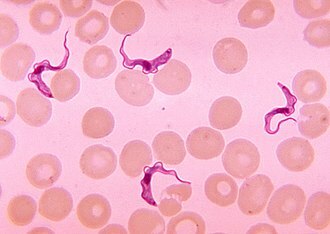 Many birds, human-commensal rodents (especially rats) and reptiles also prey on cochineal insects. In regions dependent on cochineal production, pest control measures are taken seriously. For small-scale cultivation, manual methods of control have proved to be the safest and most effective. For large-scale cultivation, advanced pest control methods have to be developed, including alternative bioinsecticides or traps with pheromones. Opuntia species, known commonly as prickly pears, were first brought to Australia in an attempt to start a cochineal dye industry in 1788. Captain Arthur Phillip collected a number of cochineal-infested plants from Brazil on his way to establish the first European settlement at Botany Bay, part of which is now Sydney, New South Wales. 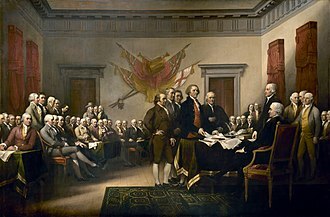 At that time, Spain and Portugal had a worldwide cochineal dye monopoly via their New World colonial sources, and the British desired a source under their own control, as the dye was important to their clothing and garment industries; it was used to colour the British soldiers' red coats, for example. The attempt was a failure in two ways: the Brazilian cochineal insects soon died off, but the cactus thrived, eventually overrunning about 100,000 sq mi (259,000 km2) of eastern Australia. The cacti were eventually brought under control in the 1920s by the deliberate introduction of a South American moth, Cactoblastis cactorum, the larvae of which feed on the cactus. The nopal pear has been traditionally eaten in parts of northern Ethiopia, where it is utilized more than cultivated. Carmine cochineal was introduced into northern Ethiopia early in the 2000s to be cultivated among farming communities. Foodsafe exported 2000 tons of dried carmine cochineal over 3 years. A conflict of interest among communities led to closure of the cochineal business in Ethiopia, but the insect spread and became a pest. Cochineal infestation continued to expand after the cochineal business had ended. Control measures were unsuccessful and by 2014 about 16,000 hectares (62 sq mi) of cactus land had become infested with cochineal. As of 2005,[needs update] Peru produced 200 tons of cochineal dye per year and the Canary Islands produced 20 tons per year. Chile and Mexico also export cochineal. In Mexico, production and exportation of the dye has been found to lower poverty and improve female literacy. France is believed to be the world's largest importer, and Japan and Italy also import the insect. Much of these imports are processed and re-exported to other developed economies. As of 2005,[needs update] the market price of cochineal was between US$50 and 80 per kilogram,[needs update] while synthetic raw food dyes are available at prices as low as $10–20 per kilogram. Traditionally, cochineal was used for colouring fabrics. During the colonial period, with the introduction of sheep to Latin America, the use of cochineal increased, as it provided the most intense colour and it set more firmly on woolen garments than on clothes made of materials of pre-Hispanic origin such as cotton or agave and yucca fibers. In general, cochineal is more successful on protein-based animal fibres (including silk) than plant-based material. Once the European market discovered the qualities of this product, the demand for it increased dramatically. By the beginning of the 17th century, it was traded internationally. Carmine became strong competition for other colourants such as madder root, kermes, Polish cochineal, Armenian cochineal, brazilwood, and Tyrian purple, as they were used for dyeing the clothes of kings, nobles, and the clergy. For the past several centuries, it was the most important insect dye used in the production of hand-woven oriental rugs, almost completely displacing lac. 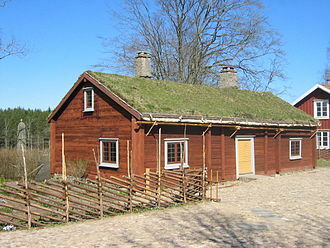 It was also used for painting, handicrafts, and tapestries. Cochineal-coloured wool and cotton are important materials for Mexican folk art and crafts. Cochineal is used as a fabric and cosmetics dye and as a natural food colouring. 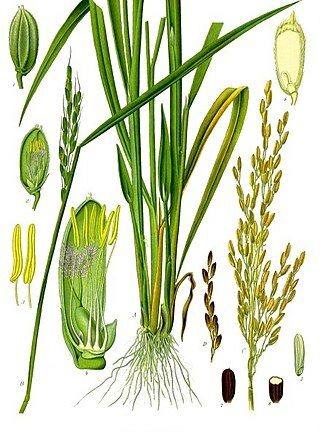 It is also used in histology as a preparatory stain for the examination of tissues and carbohydrates. In artists' paints, it has been replaced by synthetic reds and is largely unavailable for purchase due to poor lightfastness. Natural carmine dye used in food and cosmetics can render the product unacceptable to vegetarian or vegan consumers. Many Muslims consider carmine-containing food forbidden (haraam) because the dye is extracted from insects and all insects except the locust are haraam in Islam. Jews also avoid food containing this additive, though it is not treif, and some authorities allow its use because the insect is dried and reduced to powder. Cochineal is one of the few water-soluble colourants to resist degradation with time. It is one of the most light- and heat-stable and oxidation-resistant of all the natural organic colourants and is even more stable than many synthetic food colours. The water-soluble form is used in alcoholic drinks with calcium carmine; the insoluble form is used in a wide variety of products. Together with ammonium carmine, they can be found in meat, sausages, processed poultry products (meat products cannot be coloured in the United States unless they are labeled as such), surimi, marinades, alcoholic drinks, bakery products and toppings, cookies, desserts, icings, pie fillings, jams, preserves, gelatin desserts, juice beverages, varieties of cheddar cheese and other dairy products, sauces, and sweets. Carmine is considered safe enough for cosmetic use in the eye area. A significant proportion of the insoluble carmine pigment produced is used in the cosmetics industry for hair- and skin-care products, lipsticks, face powders, rouges, and blushes. A bright red dye and the stain carmine used in microbiology is often made from the carmine extract, too. The pharmaceutical industry uses cochineal to colour pills and ointments. In spite of the widespread use of carmine-based dyes in food and cosmetic products, a small number of people have been found to experience occupational asthma, food allergy and cosmetic allergies (such as allergic rhinitis and cheilitis), IgE-mediated respiratory hypersensitivity, and in rare cases anaphylactic shock. In 2009 the FDA ruled that labels of cosmetics and food that include cochineal extract must include that information on their labels (under the name "cochineal extract" or "carmine"). In 2006 the FDA stated it found no evidence of a "significant hazard" to the general population. In the EU authorities list carmine as additive E 120 in the list of EU-approved food additives. An artificial, non-allergenic cochineal dye is labeled E 124. The directive governing food dyes approves the use of carmine for certain groups of foods only, but is still found in several products particularly alcoholic beverages. ^ a b c d Liberato Portillo M.; Ana Lilia Vigueras G. "Natural Enemies of Cochineal (Dactylopius coccus Costa): Importance in Mexico" (PDF). Archived from the original (PDF) on March 26, 2009. Retrieved July 14, 2005. ^ "Cochineal". Online Etymology Dictionary. Retrieved 2015-05-06. ^ a b Threads In Tyme, LTD. "Time line of fabrics". Archived from the original on October 28, 2005. Retrieved July 14, 2005. ^ a b Dr. Aguilar, Moreno (2006). 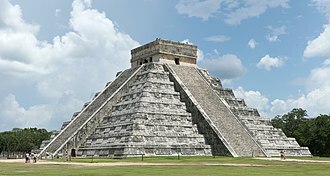 Handbook to Life in the Aztec World. Los Angeles: California State University. p. 344. ISBN 0-8160-5673-0. ^ a b Behan, J. "The bug that changed history". Retrieved June 26, 2006. ^ a b c d Eiland & Eiland 1998, p. 55. ^ Schiebinger 2004, p. 44. ^ a b Hernández, O. "Cochineal". Mexico Desconocido Online. Archived from the original on October 16, 2007. Retrieved July 15, 2005. ^ a b c "Canary Islands cochineal producers homepage". Retrieved July 14, 2005. ^ Schiebinger 2004, p. 39. ^ Whitney, Alyson V.; Van Duyne, Richard P.; Casadio, Francesca (2006). "An innovative surface-enhanced Raman spectroscopy (SERS) method for the identification of six historical red lakes and dyestuffs". Journal of Raman Spectroscopy. 37 (10): 993–1002. Bibcode:2006JRSp...37..993W. doi:10.1002/jrs.1576. ^ Magaloni Kerpel, Diana (2014). 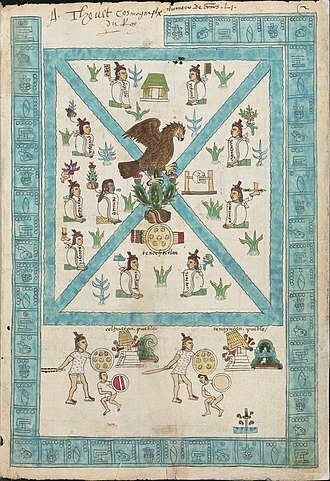 The Colors of the New World: Artists, Materials, and the Creation of the Florentine Codex. Los Angeles, CA: The Getty Research Institute. p. 45. ISBN 978-1-60606-329-3. ^ Eisner, T. (2003). For Love of Insects. Cambridge, Massachusetts: Belknap Press of Harvard University Press. ISBN 0-674-01827-3. ^ a b Olson, C. "Cochineal". Urban Integrated Pest Management. Archived from the original on November 19, 2005. Retrieved July 19, 2005. ^ a b Armstrong, W. P. "Cochineal, Saffron & Woad Photos". Economic Plant Photographs. Retrieved July 14, 2005. ^ Nobel, P. S. (2002). Cacti: Biology and Uses. Berkeley: University of California Press. p. 226. ISBN 0-520-23157-0. ^ a b c "Cultivation of Cochineal in Oaxaca". Go-Oaxaca Newsletter. Archived from the original on June 8, 2008. Retrieved July 15, 2005. ^ Ferris, G. Floyd (1955). Atlas of the Scale Insects of North America, Volume VII. Stanford University Press. pp. 85–90. ISBN 0-8047-1667-6. ^ "definition of nopalry from Webster Dictionary. Accessed Nov. 4, 2009". Webster-dictionary.net. Retrieved November 13, 2009. ^ a b c d e Foodnet. "Tropical commodities and their markets". Archived from the original on July 31, 2012. Retrieved July 14, 2005. ^ "Prickly Pear in Australia". Northwestweeds.nsw.gov.au. June 26, 1987. Archived from the original on October 30, 2009. Retrieved November 13, 2009. ^ a b Greenfield 2005, p. 188. ^ Diaz-Cayeros, Alberto; Jha, Saumitra (2012). "Contracts and Poverty Alleviation in Indigenous Communities: Cochineal in Mexico" (PDF). Global Trade. ^ "Price Quote". Retrieved July 15, 2005. ^ Meyer, L. "Dyeing Red". West Kingdom (SCA) Arts and Sciences Tourney, July 2004. Archived from the original on February 2, 2006. Retrieved July 19, 2005. ^ Athens, G.A. "Dazzling Color in the Land of the Inca: A Centuries-old Dye Still Important in Histology Today" (PDF). Histologic. XLVI (2). Archived from the original (PDF) on 2015-07-16. ^ "E-Numbers List: Cochineal / Carminic Acid". Muslim Consumer Group. Retrieved June 16, 2015. ^ a b c Wild Flavors, Inc. "E120 Cochineal". The wild world of solutions. Retrieved July 19, 2005. ^ U.S. Food and Drug Administration (June 9, 2015). "Summary of Color Additives for Use in United States in Foods, Drugs, Cosmetics, and Medical Devices". Silver Spring, Maryland: U.S. Department of Health and Human Services. Retrieved July 10, 2015. ^ a b Voltolini S, Pellegrini S, Contatore M, Bignardi D, Minale P (2014). "New risks from ancient food dyes: cochineal red allergy" (PDF). European Annals of Allergy and Clinical Immunology. 46 (6): 232–3. PMID 25398168. ^ D'Mello, J. P. Felix (2003). Food Safety: Contaminants and Toxins. Wallingford, Oxon: CABI Pub. p. 256. ISBN 0-85199-607-8. ^ DiCello, Michael C.; Myc, Andrzej; Baker, James R.; Baldwin, James L. (1999). "Anaphylaxis After Ingestion of Carmine Colored Foods: Two Case Reports and a Review of the Literature". Allergy and Asthma Proceedings. 20 (6): 377–82. doi:10.2500/108854199778251816. PMID 10624494. ^ FDA. Guidance for Industry: Cochineal Extract and Carmine: Declaration by Name on the Label of All Foods and Cosmetic Products That Contain These Color Additives; Small Entity Compliance Guide. Silver Spring, MD:U.S. Food & Drug Administration (updated June 7, 2011). [accessed July 16, 2015]. ^ "Bug-Based Food Dye Should Be ... Exterminated, Says CSPI". Center for Science in the Public Interest. May 1, 2006. Retrieved October 4, 2013. ^ "FDA: You're eating crushed bug juice". Archived from the original on February 10, 2006. ^ "Food Standards Agency – Current EU approved additives and their E Numbers". Food.gov.uk. March 14, 2012. Retrieved October 4, 2013. Baskes, Jeremy (2000). 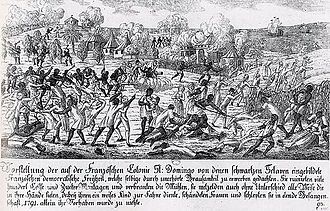 Indians, Merchants and Markets: A Reinterpretation of the Repartimiento and Spanish-Indian Economic Relations in Colonial Oaxaca, 1750–1821. Stanford: Stanford University Press. ISBN 0-8047-3512-3. Donkin, R. A. (1977). 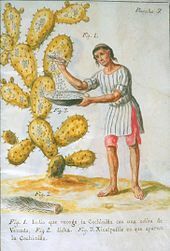 "Spanish Red: An Ethnogeographical Study of Cochineal and the Opuntia Cactus". Transactions of the American Philosophical Society. 67 (5): 1–84. doi:10.2307/1006195. JSTOR 1006195. Eiland, Murray L., Jr. & Eiland, Murray L., III (1998). Oriental Carpets. Boston: Little, Brown and Company. ISBN 0-8212-2548-0. Greenfield, Amy Butler (2005). A Perfect Red: Empire, Espionage, and the Quest for the Color of Desire. New York: Harper Collins Press. ISBN 0-06-052276-3. Hamnett, Brian (1971). Politics and Trade in Southern Mexico, 1750–1821. Cambridge: Cambridge University Press. ISBN 0-521-07860-1. McCreery, David (1996). Rural Guatemala 1760–1940. Stanford: Stanford University Press. ISBN 0-8047-2792-9. Schiebinger, L. L. (2004). Plants and Empire: Colonial Bioprospecting in the Atlantic World. Cambridge, Massachusetts: Harvard University Press. ISBN 0-674-01487-1. Wikimedia Commons has media related to Cochineal. Look up cochineal in Wiktionary, the free dictionary. Felter, Harvey Wickes; Lloyd, John Uri (1898). "Coccus (U.S.P.)—Cochineal". King's American Dispensatory. Retrieved July 14, 2005. Direction of the Council of the Pharmaceutical Society of Great Britain (1911). "Coccus, B.P." The British Pharmaceutical Codex. Retrieved July 14, 2005. Sayre, Lucius E. (1917). "Coccus.—Cochineal". A Manual of Organic Materia Medica and Pharmacognosy. Retrieved July 14, 2005. Zhang, Jane (January 27, 2006). "Is There a Bug in Your Juice? New Food Labels Might Say". The Wall Street Journal. Archived from the original on January 12, 2009. Greig, J. B. "Cochineal extract, carmine, and carminic acid". WHO food additive series 46. Retrieved June 2, 2007. Dutton, LaVerne M. "Cochineal: A Bright Red Animal Dye". Master's Thesis for Baylor University. Retrieved November 13, 2010. The scale insects are small insects of the order Hemiptera, suborder Sternorrhyncha. They comprise the superfamily Coccoidea, previously placed in the now obsolete group called Homoptera, there are about 8,000 described species of scale insects. Scale insects vary dramatically in appearance, from small organisms that grow beneath wax covers, to shiny pearl-like objects. Adult female scales are almost always immobile and permanently attached to the plant they have parasitized and they secrete a waxy coating for defense, this coating causes them to resemble reptilian scales or fish scales, hence their common name. The group shows high degrees of sexual dimorphism, female scale insects, unusually for Hemiptera, retain the external morphology even when sexually mature. Adult males usually have wings but never feed, and die within a day or two, species in which males do have wings generally possess only one pair of fully functional wings, and in particular, the forewings. This is unusual among insects, it most closely resembles the situation in the true flies, the hind wings of scale insects are reduced, commonly to the point that they generally are overlooked. In some species the hind wings have hamuli, that couple the wings to the main wings. 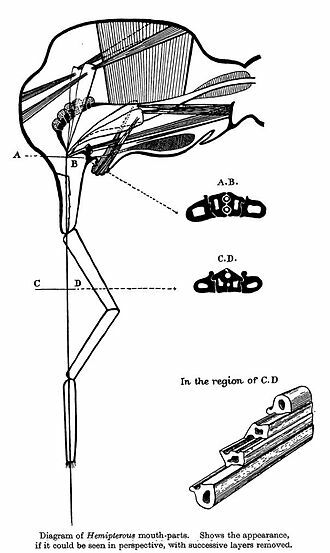 The vestigial wings often are reduced to the point where they are referred to as halteres or pseudohalteres and it is not at present clear to what extent the pseudohalteres have any substantial control function to match the true halteres of the flies. The first instars of most species of scale insects emerge from the egg with functional legs and are called crawlers. They immediately crawl around in search of a spot to settle down. There are many variations on themes, such as scale insects that are associated with species of ants that act as herders. In either case, many species of crawlers, when they change their skins, lose the use of their legs if they are female. Only the males retain their legs and use them in seeking females for mating, the specifics of their reproductive systems vary considerably within the group, including three forms of hermaphroditism and at least seven forms of parthenogenesis. Most scale insects are parasites of plants, feeding on sap drawn directly from the vascular system. A few species feed on fungal mats and fungi, e. g.
Carmine, called cochineal, cochineal extract, crimson lake or carmine lake, natural red 4, C. I. 75470, or E120, is a pigment of a bright-red color obtained from the salt of carminic acid. The pigment is produced from some scale insects such as the cochineal scale, the English word carmine is derived from the French word carmin, from Medieval Latin carminium, from Arabic qirmiz, which itself derives from Middle Persian carmir. The Persian term carmir might come from Sanskrit krimiga, from krmi The term may be influenced in Latin by minium, purity of color is ensured by the absence of iron. Stannous chloride, citric acid, borax, or gelatin may be added to regulate the formation of the precipitate. For shades of purple, lime is added to the alum, Carmine may be prepared from cochineal, by boiling dried insects in water to extract the carminic acid and treating the clear solution with alum. Other common substances such as cream of tartar, stannous chloride, or potassium hydrogen oxalate can be used to effect the precipitation, use of these chemicals causes the coloring and animal matters present in the liquid to be precipitated to give a lake pigment. Aluminum from the alum gives the traditional color to carminic acid precipitates. This color is degraded by the presence of iron salts, addition of lime can give carminic acid lakes a purple cast. Other methods for the production of dye are in use, in which egg white, fish glue. The quality of carmine is affected by the temperature and the degree of illumination during its preparation and it differs according to the amount of alumina present in it. It is sometimes adulterated with cinnabar and other materials, from these, good carmine should crumble readily between the fingers when dry. Carmine can be used as an agent in histology, as a Bests carmine to stain glycogen, mucicarmine to stain acidic mucopolysaccharides. In these applications, it is applied together with a mordant, Carmine was used in dyeing textiles and in painting since antiquity. It is not very stable in oil paint, and its use ceased after new, jacopo Tintoretto used carmine in several of his paintings, including Portrait of Vincenzo Morosini and Christ Washing the Feet of the Disciples. Food coloring, or color additive, is any dye, pigment or substance that imparts color when it is added to food or drink. They come in many forms consisting of liquids, gels, Food coloring is used both in commercial food production and in domestic cooking. Food colorants are used in a variety of non-food applications including cosmetics, home craft projects. People associate certain colors with certain flavors, and the color of food can influence the flavor in anything from candy to wine. During the Middle Ages, the economy in the European countries was based on agriculture, under feudalism, aesthetic aspects were not considered, at least not by the vast majority of the generally very poor population. This situation changed with urbanization at the beginning of the Modern Age, one of the very first food laws, created in Augsburg, Germany, in 1531, concerned spices or colorants and required saffron counterfeiters to be burned. With the onset of the revolution, people became dependent on foods produced by others. These new urban dwellers demanded food at low cost, analytical chemistry was still primitive and regulations few. Copper arsenite was used to recolor used tea leaves for resale and it caused two deaths when used to color a dessert in 1860. Again his tea if mixed or green, he would not escape without the administration of a little Prussian blue. Many color additives had never tested for toxicity or other adverse effects. Historical records show that injuries, even deaths, resulted from tainted colorants, in 1851, about 200 people were poisoned in England,17 of them fatally, directly as a result of eating adulterated lozenges. Originally, these were dubbed coal-tar colors because the materials were obtained from bituminous coal. Many synthesized dyes were easier and less costly to produce and were superior in coloring properties when compared to naturally derived alternatives, some synthetic food colorants are diazo dyes. Diazo dyes are prepared by coupling of a compound with a second aromatic hydrocarbons. Alizarin or 1, 2-dihydroxyanthraquinone is an organic compound with formula C 14H 8O4 that has been used throughout history as a prominent red dye, principally for dyeing textile fabrics. Historically it was derived from the roots of plants of the madder genus, in 1869, it became the first natural pigment to be duplicated synthetically. Alizarin is the ingredient for the manufacture of the madder lake pigments known to painters as Rose madder. A notable use of alizarin in modern times is as an agent in biological research because it stains free calcium. Alizarin continues to be used commercially as a red textile dye, Madder has been cultivated as a dyestuff since antiquity in central Asia and Egypt, where it was grown as early as 1500 BC. Cloth dyed with madder root pigment was found in the tomb of the Pharaoh Tutankhamun and in the ruins of Pompeii, in the Middle Ages, Charlemagne encouraged madder cultivation. Madder was widely used as a dye in Western Europe in the Late Medieval centuries, in 17th century England, alizarin was used as a red dye for the clothing of the parliamentary New Model Army. The distinctive red color would continue to be worn for centuries, giving English, the madder dyestuff is combined with a dye mordant. According to which mordant used, the color may be anywhere from pink through purple to dark brown. In the 18th century the most valued color was a bright red known as Turkey Red, the combination of mordants and overall technique used to obtain the Turkey Red originated in the Middle East or Turkey. It was a complex and multi-step technique in its Middle Eastern formulation, the process was simplified in late 18th-century Europe. This resulting madder lake has a color, and can be used more efficaciously. This general method of preparing lakes has been known for centuries but was simplified in the late 18th, in 1826, the French chemist Pierre-Jean Robiquet found that madder root contained two colorants, the red alizarin and the more rapidly fading purpurin. About the same time, the English dye chemist William Henry Perkin independently discovered the same synthesis, the subsequent discovery that anthracene could be abstracted from coal tar further advanced the importance and affordability of alizarins artificial synthesis. The Armenian cochineal, known as the Ararat cochineal or Ararat scale, is a scale insect indigenous to the Ararat plain and Aras River valley in the Armenian Highlands. It was formerly used to produce an eponymous crimson carmine dyestuff known in Armenia as vordan karmir, the species is critically endangered within Armenia. The Armenian cochineal scale insect, Porphyrophora hamelii, is in a different taxonomic family from the found in the Americas. Both insects produce red dyestuffs that are commonly called cochineal. In the Early Middle Ages the Armenian historians Ghazar Parpetsi and Movses Khorenatsi wrote specifically of a worm-produced dyestuff from the Ararat region, during the Middle Ages the Armenian cochineal dyestuff vordan karmir, known in Persia as kirmiz, was widely celebrated in the Near East. Kirmiz is not to be confused with dyers kermes, which was derived from another insect, the Arabs and Persians regarded kirmiz as one of the most valuable commodities exported from Armenia. The Armenians themselves used vordan karmir to produce dyes for textiles and pigments for illuminated manuscripts and it has been estimated that on the order of a half million dried Porphyrophora hamelii insects were required to dye one kilogram of silk crimson during this period. The carmine dyestuff of Porphyrophora hamelii owes its red color almost entirely to carminic acid, the dyestuff of Porphyrophora polonica can be distinguished by its small admixture of kermesic acid, which is the major constituent of kermes from Kermes vermilio. Porphyrophora hamelii is a sexually-dimorphic species, the adult female, from which carmine is extracted, is oval-shaped, soft-bodied, crimson in color, and has large forelegs for digging. The females can be large for a Porphyrophora species, up to 10–12 mm long and 7 mm wide. It has been noted that one pound of cochineal insects requires 18, 000–23,000 specimens of Porphyrophora hamelii. The adult male Porphyrophora hamelii is a winged insect, the life cycle of Porphyrophora hamelii is mostly subterranean. Red alizarin stained juvenile Roosterfish (Nematistius pectoralis) lit by fluorescent light.